↑ "Drugs that physically interact with Inhibitor of nuclear factor kappa-B kinase subunit beta view/edit references on wikidata". 1 2 BBC News. 14 November 2005. Stroke 'cell-death trigger' found. Retrieved on June 28, 2007. ↑ Schwaninger M, Inta I, Herrmann O (2006). "NF-kappaB signalling in cerebral ischaemia". Biochemical Society Transactions. 34 (Pt 6): 1291–4. doi:10.1042/BST0341291. PMID 17073804. ↑ Herrmann O, Baumann B, de Lorenzi R, Muhammad S, Zhang W, Kleesiek J, Malfertheiner M, Köhrmann M, Potrovita I, Maegele I, Beyer C, Burke JR, Hasan MT, Bujard H, Wirth T, Pasparakis M, Schwaninger M (2005). "IKK mediates ischemia-induced neuronal death". Nature Medicine. 11 (12): 1322–9. doi:10.1038/nm1323. PMID 16286924. ↑ Heckmann A, Waltzinger C, Jolicoeur P, Dreano M, Kosco-Vilbois MH, Sagot Y (2004). "IKK2 inhibitor alleviates kidney and wasting diseases in a murine model of human AIDS". Am. J. Pathol. 164 (4): 1253–62. doi:10.1016/S0002-9440(10)63213-0. PMC 1615343 . PMID 15039214. ↑ "Salmonella infection data for Ikbkb". Wellcome Trust Sanger Institute. ↑ "Citrobacter infection data for Ikbkb". Wellcome Trust Sanger Institute. 1 2 3 Gerdin AK (2010). "The Sanger Mouse Genetics Programme: High throughput characterisation of knockout mice". Acta Ophthalmologica. 88 (S248): 0. doi:10.1111/j.1755-3768.2010.4142.x. ↑ Skarnes WC, Rosen B, West AP, Koutsourakis M, Bushell W, Iyer V, Mujica AO, Thomas M, Harrow J, Cox T, Jackson D, Severin J, Biggs P, Fu J, Nefedov M, de Jong PJ, Stewart AF, Bradley A (2011). "A conditional knockout resource for the genome-wide study of mouse gene function". Nature. 474 (7351): 337–342. doi:10.1038/nature10163. PMC 3572410 . PMID 21677750. 1 2 3 Chen G, Cao P, Goeddel DV (February 2002). "TNF-induced recruitment and activation of the IKK complex require Cdc37 and Hsp90". Mol. Cell. 9 (2): 401–10. doi:10.1016/S1097-2765(02)00450-1. ISSN 1097-2765. PMID 11864612. ↑ Zandi E, Rothwarf DM, Delhase M, Hayakawa M, Karin M (October 1997). "The IkappaB kinase complex (IKK) contains two kinase subunits, IKKalpha and IKKbeta, necessary for IkappaB phosphorylation and NF-kappaB activation". Cell. 91 (2): 243–52. doi:10.1016/S0092-8674(00)80406-7. ISSN 0092-8674. PMID 9346241. 1 2 Otsuki T, Young DB, Sasaki DT, Pando MP, Li J, Manning A, Hoekstra M, Hoatlin ME, Mercurio F, Liu JM (2002). "Fanconi anemia protein complex is a novel target of the IKK signalsome". J. Cell. Biochem. 86 (4): 613–23. doi:10.1002/jcb.10270. ISSN 0730-2312. PMID 12210728. ↑ May MJ, D'Acquisto F, Madge LA, Glöckner J, Pober JS, Ghosh S (September 2000). "Selective inhibition of NF-kappaB activation by a peptide that blocks the interaction of NEMO with the IkappaB kinase complex". Science. 289 (5484): 1550–4. doi:10.1126/science.289.5484.1550. ISSN 0036-8075. PMID 10968790. 1 2 3 4 Woronicz JD, Gao X, Cao Z, Rothe M, Goeddel DV (October 1997). "IkappaB kinase-beta: NF-kappaB activation and complex formation with IkappaB kinase-alpha and NIK". Science. 278 (5339): 866–9. doi:10.1126/science.278.5339.866. ISSN 0036-8075. PMID 9346485. 1 2 Deng L, Wang C, Spencer E, Yang L, Braun A, You J, Slaughter C, Pickart C, Chen ZJ (October 2000). "Activation of the IkappaB kinase complex by TRAF6 requires a dimeric ubiquitin-conjugating enzyme complex and a unique polyubiquitin chain". Cell. 103 (2): 351–61. doi:10.1016/S0092-8674(00)00126-4. ISSN 0092-8674. PMID 11057907. ↑ Yeung KC, Rose DW, Dhillon AS, Yaros D, Gustafsson M, Chatterjee D, McFerran B, Wyche J, Kolch W, Sedivy JM (November 2001). "Raf Kinase Inhibitor Protein Interacts with NF-κB-Inducing Kinase and TAK1 and Inhibits NF-κB Activation". Mol. Cell. Biol. 21 (21): 7207–17. doi:10.1128/MCB.21.21.7207-7217.2001. ISSN 0270-7306. PMC 99896 . PMID 11585904. ↑ Lamberti C, Lin KM, Yamamoto Y, Verma U, Verma IM, Byers S, Gaynor RB (November 2001). "Regulation of beta-catenin function by the IkappaB kinases". J. Biol. Chem. 276 (45): 42276–86. doi:10.1074/jbc.M104227200. ISSN 0021-9258. PMID 11527961. ↑ Chariot A, Leonardi A, Muller J, Bonif M, Brown K, Siebenlist U (October 2002). "Association of the adaptor TANK with the I kappa B kinase (IKK) regulator NEMO connects IKK complexes with IKK epsilon and TBK1 kinases". J. Biol. Chem. 277 (40): 37029–36. doi:10.1074/jbc.M205069200. ISSN 0021-9258. PMID 12133833. 1 2 Wu RC, Qin J, Hashimoto Y, Wong J, Xu J, Tsai SY, Tsai MJ, O'Malley BW (May 2002). "Regulation of SRC-3 (pCIP/ACTR/AIB-1/RAC-3/TRAM-1) Coactivator Activity by IκB Kinase". Mol. Cell. Biol. 22 (10): 3549–61. doi:10.1128/MCB.22.10.3549-3561.2002. ISSN 0270-7306. PMC 133790 . PMID 11971985. ↑ Shifera AS, Horwitz MS (March 2008). "Mutations in the zinc finger domain of IKK gamma block the activation of NF-kappa B and the induction of IL-2 in stimulated T lymphocytes". Mol. Immunol. 45 (6): 1633–45. doi:10.1016/j.molimm.2007.09.036. ISSN 0161-5890. PMID 18207244. ↑ Vig E, Green M, Liu Y, Yu KY, Kwon HJ, Tian J, Goebl MG, Harrington MA (March 2001). "SIMPL is a tumor necrosis factor-specific regulator of nuclear factor-kappaB activity". J. Biol. Chem. 276 (11): 7859–66. doi:10.1074/jbc.M010399200. ISSN 0021-9258. PMID 11096118. ↑ Mercurio F, Murray BW, Shevchenko A, Bennett BL, Young DB, Li JW, Pascual G, Motiwala A, Zhu H, Mann M, Manning AM (February 1999). "IκB Kinase (IKK)-Associated Protein 1, a Common Component of the Heterogeneous IKK Complex". Mol. Cell. Biol. 19 (2): 1526–38. doi:10.1128/mcb.19.2.1526. ISSN 0270-7306. PMC 116081 . PMID 9891086. ↑ Cohen L, Henzel WJ, Baeuerle PA (September 1998). 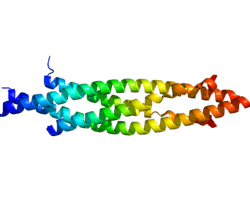 "IKAP is a scaffold protein of the IkappaB kinase complex". Nature. 395 (6699): 292–6. doi:10.1038/26254. ISSN 0028-0836. PMID 9751059. ↑ Luftig MA, Cahir-McFarland E, Mosialos G, Kieff E (May 2001). "Effects of the NIK aly mutation on NF-kappaB activation by the Epstein-Barr virus latent infection membrane protein, lymphotoxin beta receptor, and CD40". J. Biol. Chem. 276 (18): 14602–6. doi:10.1074/jbc.C100103200. ISSN 0021-9258. PMID 11278268. ↑ Heissmeyer V, Krappmann D, Hatada EN, Scheidereit C (February 2001). "Shared Pathways of IκB Kinase-Induced SCFβTrCP-Mediated Ubiquitination and Degradation for the NF-κB Precursor p105 and IκBα". Mol. Cell. Biol. 21 (4): 1024–35. doi:10.1128/MCB.21.4.1024-1035.2001. ISSN 0270-7306. PMC 99557 . PMID 11158290. ↑ Heissmeyer V, Krappmann D, Wulczyn FG, Scheidereit C (September 1999). "NF-kappaB p105 is a target of IkappaB kinases and controls signal induction of Bcl-3-p50 complexes". EMBO J. 18 (17): 4766–78. doi:10.1093/emboj/18.17.4766. ISSN 0261-4189. PMC 1171549 . PMID 10469655. ↑ Prajapati S, Verma U, Yamamoto Y, Kwak YT, Gaynor RB (January 2004). "Protein phosphatase 2Cbeta association with the IkappaB kinase complex is involved in regulating NF-kappaB activity". J. Biol. Chem. 279 (3): 1739–46. doi:10.1074/jbc.M306273200. ISSN 0021-9258. PMID 14585847. ↑ Zhang SQ, Kovalenko A, Cantarella G, Wallach D (March 2000). "Recruitment of the IKK signalosome to the p55 TNF receptor: RIP and A20 bind to NEMO (IKKgamma) upon receptor stimulation". Immunity. 12 (3): 301–11. doi:10.1016/S1074-7613(00)80183-1. ISSN 1074-7613. PMID 10755617. ↑ Chaudhary PM, Eby MT, Jasmin A, Kumar A, Liu L, Hood L (September 2000). "Activation of the NF-kappaB pathway by caspase 8 and its homologs". Oncogene. 19 (39): 4451–60. doi:10.1038/sj.onc.1203812. ISSN 0950-9232. PMID 11002417. ↑ Devin A, Lin Y, Yamaoka S, Li Z, Karin M (June 2001). "The α and β Subunits of IκB Kinase (IKK) Mediate TRAF2-Dependent IKK Recruitment to Tumor Necrosis Factor (TNF) Receptor 1 in Response to TNF". Mol. Cell. Biol. 21 (12): 3986–94. doi:10.1128/MCB.21.12.3986-3994.2001. ISSN 0270-7306. PMC 87061 . PMID 11359906.